Miss Berry tells Mrs. Hadley that her gift has brought her courage to continue in the work of the Berry Schools and explains the importance of giving to Berry. She sends her condolences for Mrs. Hadley's husband and tells her she's taken his name off the mailing list. Miss Jane Griffith Keys sends a $10.00 contribution to the Berry Schools to help towards the rebuilding of the dormitory lost by fire. 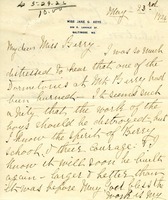 Hammond, writing from the school during a visit of the Pilgrims, stresses the power of prayer and encourages Berry to stand by her own motto, "prayer changes things." God still has work for Berry to do and will give Berry the strength to do it. Hammond writes that Berry should claim health as her birthright so that when Hammond visits in April 1942 she will find Berry full of vigor. 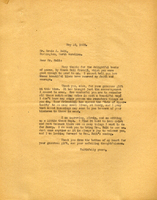 Hammond writes that her heart is overflowing with gratitude for the visit and the inspiration of looking into Berry's face.